Union state militia troops advance into Washington, D.C. Indeed, as the militia regiment transferred between stations, a mob of anti-war supporters and Southern sympathizers attacked the train cars and blocked the route. When it became apparent that they could travel by horse no further, the four companies, about 240 soldiers, got out of the cars and marched in formation through the city. However, the mob followed the soldiers, breaking store windows[ citation needed] and causing damage until they finally blocked the soldiers. 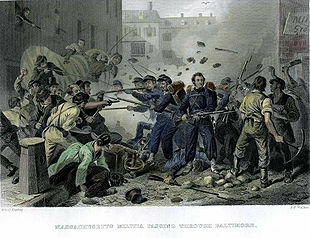 The mob attacked the rear companies of the regiment with "bricks, paving stones, and pistols." In response, several soldiers fired into the mob, beginning a giant brawl between the soldiers, the mob, and the Baltimore police. In the end, the soldiers got to the Camden Station, and the police were able to block the crowd from them. The regiment had left behind much of their equipment, including their marching band's instruments. ^ Vogler, Mark E. (April 18, 2009). "Civil War Guard on duty in Baltimore to save President Street Station". eagletribune.com. Eagle Tribune in Lawrence, Massachusetts. Archived from the original on April 19, 2009. Retrieved April 28, 2015. ^ "Baltimore: A House Divided & War on the Chesapeake Bay". CivilWarTraveler.com. January 13, 2008. Archived from the original on June 27, 2012. Retrieved July 14, 2012. ^ Ezratty, Baltimore in the Civil War (2010), p. 31. ^ Ezratty, Baltimore in the Civil War (2010), p. 31. "Baltimore's citizens were politically and emotionally divided between pro- and anti-South and slavery. There were clashes as passions ran high about these issues and the right of a state to secede from the Union." ^ a b Gary L. Browne, "Baltimore Riot (19 April 1861)", Encyclopedia of the American Civil War, ed. David Stephen Heidler, Jeanne T. Heidler, David J. Coles; New York: Norton, 2000, p. 173; ISBN 9780393047585. ^ Ezratty, Baltimore in the Civil War (2010), pp. 43–45. ^ Carton, Bruce (January 1, 1961). The Coming Fury. Doubleday & Company, Inc. pp. 340–341. ISBN 0-671-43414-4. ^ Ezratty, Baltimore in the Civil War (2010), p. 45. ^ The first connection was created with the opening of the Baltimore and Potomac Tunnel in 1873. ^ Ezratty, Baltimore in the Civil War (2010), p. 47. "...the thirty-year-old ordinance forbidding the operation of steam engines in the city obliged the Union troops on both the eighteenth and nineteenth to transfer from their terminating depots on their way to Camden Station, where trains to Washington awaited them. The forced transfer made the soldiers of the Sixth Massachusetts vulnerable as, unlike the Pennsylvanians a day earlier, they had to stop and wait while horsecars hitched up and then rolled over Pratt Street's rails to Camden Station." ^ Jones' report also notes that during their travel, a James Brady was "taken insane" and left in Delanco Township, New Jersey, with J. C. Buck. ^ United States. War Department. The War of the Rebellion: A Compilation of the Official Records of the Union and Confederate Armies. Series 1. Edited by John Sheldon Moody, et al. Vol. 2. Washington, DC: Government Printing Office, 1880, p. 7. ^ James M. McPherson (1988). Battle Cry of Freedom: The Civil War Era. Oxford University Press. p. 40. ISBN 0-19-516895-X. ^ Phillip Fazzini. "Luther C. Ladd". Photos from the Past. Sons of Union Veterans of the Civil War. Archived from the original on February 10, 2008. Retrieved February 6, 2008. ^ a b Phillip Fazzini (October 23, 2009). "Charles A. Taylor (1836–1861)". Find A Grave Memorial# 43430939. Find A Grave. Retrieved August 26, 2011. ^ James Ford Rhodes (1917). 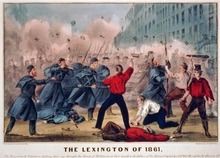 History of the Civil War, 1861–1865. The Macmillan Company, New York. p. 19. ^ Eric Thomsen (July 25, 2003). "Corp Sumner H. Needham". Find A Grave Memorial# 7708886. Find A Grave. ^ Eric Thomsen (July 12, 2003). "The Ladd and Whitney Monument". Find A Grave. Retrieved August 26, 2011. ^ J. Thomas Scharf (1874). The chronicles of Baltimore. Turnbull Brothers, Baltimore. p. 104. ^ Albert B. Faust (1963). "Rapp, Wilhelm". Dictionary of American Biography. VIII, Part 1. New York: Charles Scribner's Sons. pp. 384–385. ^ Alexander Crosby Brown (1961). Steam Packets on the Chesapeake. Cambridge, Maryland: Cornell Maritime Press. pp. 48–50. LCCN 61012580. ^ The New York Times. "The Baltimore Treason. ; The Indictment Against John Merryman." July 12, 1861. ^ Benson John Lossing (1866/1997), Pictorial Field Book of the Civil War, reprint, Baltimore: Johns Hopkins, Vol. I, Chap. XVII, "Events in or near the National Capital", pp. 419–420. ^ "Burning the Bridges". Straddling Secession: Thomas Holliday Hicks and the Beginning of the Civil War in Maryland. Maryland State Archives. Retrieved January 3, 2015. Merryman appealed to Roger B. Taney, ... who issued a landmark opinion saying that only Congress could suspend the right of habeas corpus. ^ Benson John Lossing (1866/1997), Pictorial Field Book of the Civil War, reprint, Baltimore: Johns Hopkins, Vol. I, Chap. XVIII, "The Capital Secured—Maryland Secessionists Subdued—Contributions by the People", pp. 434–436, [italics in reprint]. ^ Benson John Lossing (1866/1997), Pictorial Field Book of the Civil War, reprint, Baltimore: Johns Hopkins, Vol. I, Chap. XVIII, "The Capital Secured—Maryland Secessionists Subdued—Contributions by the People", pp. 439–440. ^ "States Which Seceded". eHistory.com. Archived from the original on October 6, 2014. Retrieved April 19, 2016. ^ a b c Nancy Bramucci Sheads (2005). "Teaching American History in Maryland – Documents for the Classroom: Arrest of the Maryland Legislature, 1861". Maryland State Archives. Retrieved April 3, 2016. ^ a b Schoettler, Carl (November 27, 2001). "A time liberties weren't priority". The Baltimore Sun. Retrieved October 17, 2014. ^ a b c Howard, F. K. (Frank Key) (1863). Fourteen Months in American Bastiles. London: H.F. Mackintosh. Retrieved August 18, 2014. ^ Benson John Lossing (1866/1997), Pictorial Field Book of the Civil War, reprint, Baltimore: Johns Hopkins, Vol. I, Chap. XVIII, "The Capital Secured—Maryland Secessionists Subdued—Contributions by the People", pp. 449–450, [italics in reprint]. ^ Benson John Lossing (1866/1997), Pictorial Field Book of the Civil War, reprint, Baltimore: Johns Hopkins, Chap. XXIII, "The War in Missouri—Doings of the Confederate 'Congress'—Affairs in Baltimore—Piracies", pp. 551–553. ^ Benson John Lossing (1866/1997), Pictorial Field Book of the Civil War, reprint, Baltimore: Johns Hopkins, Vol. I, Chap. XXIII, "War in Missouri—Doings of the Confederate 'Congress'—Affairs in Baltimore—Piracies", pp. 553–554. ^ Melchior, Louis (April 30, 1925). "Early fortifications in Baltimore Harbor". University of Maryland. Retrieved March 30, 2019. ^ Phair, Monty. "A Brief History of Randallstown". Baltimore County Public Libraries. Archived from the original on February 12, 2009. Retrieved July 27, 2009. ^ Maryland State Archives (2004). Maryland State Song – "Maryland, My Maryland". Retrieved December 27, 2004. ^ "Another Try for Maryland's State Song?". The Washington Post. April 6, 2000. ^ Helderman, Rosalind S. (March 1, 2009). "O Controversy!". The Washington Post. p. C01. Retrieved January 3, 2015. Harry Ezratty, Baltimore in the Civil War: The Pratt Street Riot and a City Occupied, Charleston, SC: The History Press, 2010. ISBN 978-1-60949-003-4. George William Brown, Baltimore And The Nineteenth Of April, 1861: A Study Of The War, Baltimore: N. Murray ( Johns Hopkins University), 1887.